I love this dish....very British Pub food. It's got peas, carrots, baby onions and most of all mashed potatoes. Also known as Cottage pie it was originally made with beef or lamb (mutton). Since we don't eat that way anymore, we're using seitan (here's a link to a link), but you can use TSP or TVP. Put your peeled potatoes into a large pan of cold water and bring to a boil. Continue boiling until fork tender, then drain the water and leave the potatoes in the pan until all of the water evaporates. Mash the potatoes and add the almond milk, about 1 1/2 tsp of salt and 1 teaspoon white pepper. If they're too dry, add more almond milk. If they're too wet, they'll be able to dry out in the oven. If you're using seitan, put the seitan and mushrooms in a food processor and pulse until you get the consistency of meat crumbles. If you're using TSP, TVP or ready made meat crumbles, only pulse the mushrooms. Add the meat crumbles, mushroom crumbles and all remaining ingredients except the Roasted Vegetable Stock in a large bowl. Now you can slowly add the vegetable stock until you get a wet, sticky consistency but not runny, if that makes sense. The variable here is how wet your meat substitute is. Put the meat mixture in a 9 X 12 casserole (that's what I used, but you can use whatever you have). Spread evenly and cover with the mashed potatoes. Cover with aluminum foil and bake in the oven for 45 minutes. Remove the foil and bake another 15. This recipe will taste best if made a day ahead of time. 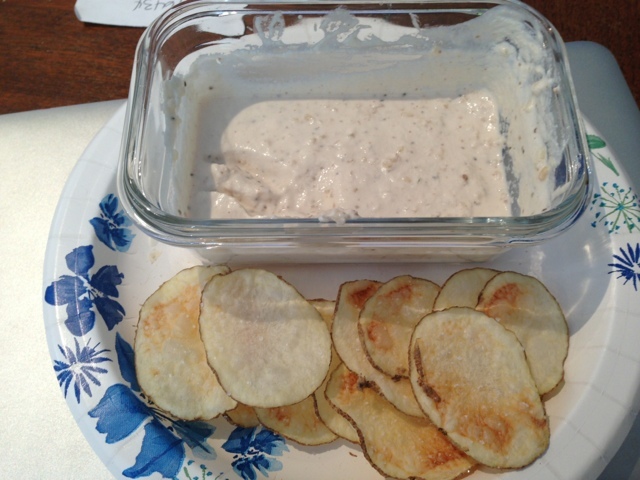 My sister kasey, who I mentioned loves my sour cream recipe, also loves and misses potato chips with onion soup dip. Here's her recipe and it's really tasty? Chips made in the microwave using the gadget I mentioned in the gadget section located here. It's also delicious to use on baked potatoes! And now something to go on the Whole wheat oat burger bun....black bean hummus burgers. Hummus burgers you ask? Well, I decided to combine crushed garbanzo beans with whole black beans to create this unique and extremely flavorful burger. It's a little spicy, but if you've followed my recipes you know I like things a bit on the hotter side. Remember though, you can always leave out the heat and it will still be delicious. As I always say, you know your own heat tolerance. I'm using Vital Wheat Gluten along with garbanzo bean flour and oat flour so if you want to go gluten free use the xantham gum instead of the Gluten. Saute' the chopped onions, bell pepper and mushrooms in a dry, hot Teflon pan. Use water or stock if it begins to stick. When it begins to brown add the garlic and Serrano chilies and saute' for another 2 minutes. Let this mixture cool. In a food processor add the rinsed garbanzo beans, tomato paste, parsley, salt and pepper. You should have a sticky paste the consistency of peanut butter. Put the mixture into a bowl and combine the remaining ingredients of rinsed black beans, brown rice, the saute' mixture of onions, bell pepper, mushrooms, garlic and chilies, and all remaining spices (cumin, chili powder and smoked paprika) and mix thoroughly. Add the flour 1/3 cup at a time and mix completely. Mixture should be fairly dry. If using the xantham gum, sprinkle it over the top of the mixture evenly, then thoroughly mix it into the mixture. Now, put the entire mixture in the refrigerator and let it set up. This is a very sticky mixture and it will be easier to form burgers if it's cool and firm. To heat the burgers, heat a Teflon or other non stick skillet until water dances off of it. Carefully put the burgers into a hot pan and don't move them. As with meat, people have a tendency to play with their food too much while cooking. Leave it alone and let it develop a crust. When it has a good crust, it will release from the pan cleanly with n(o)il. (a great tip when making bean burgers is to make them ahead of time and freeze them. Since they are so soft compared to regular burgers, they will stay together and cook more easily this way). Makes approximately nine 4 oz burgers. These burgers are a bit softer than a meat burger or one without vital wheat gluten, so make sure you use soft buns. I serve these burger on your homemade whole wheat burger buns. Throw on a slice of tomato, some lettuce, maybe a little avocado, some Dijon mustard and ketchup, some n(o)il french fries and you've got a great comfort meal. It's hard to find 100% whole flour anything with n(o)il. I've been testing a couple ideas for buns that can be used for different burgers and sandwiches. These are easy, contain n(o)il, do not use sourdough starter...oh, and they're delicious. Heat the water to between 110º and 115º Farenheit(about 1 minute 15 seconds in the microwave). If it's too hot you'll kill the yeast. Now, in a large bowl pour the water and agave or honey in and sprinkle the yeast on the top. It should be fully active in about 10-15 minutes. The water will get cloudy and form a foam on top. Add 2 cups of the flour to the yeast and water and stir until well mixed. Cover the mixture with plastic kitchen wrap and put it in the oven for 1 hour 15 minutes. When it's ready you'll see lots of gas bubbles. If you're using a mixer with a dough hook, put the remaining dry ingredients in the bowl of the mixer. Blend them with a whisk. Add the yeast/water/sweetener mixture to the dry and begin the kneading process. After about 5 minutes of kneading, add the remaining 1/2 cup of flour and continue kneading for another 10 minutes. The dough should not be sticking to the sides of the bowl at this point. The dough will be sticky and firm at the same time. Wet your hands and remove the dough to a bowl that has a scant mist of cooking spray to keep it from sticking, or if you're using a silicon bowl, not necessary. Cover the dough in plastic kitchen wrap and return it to the oven for an hour and a half. If you're doing this by hand, use the extra 1/2 cup of flour to dust your kneading surface and knead for about 10 minutes. Once the dough has doubled in size, remove the plastic and deflate the dough with your fist to the middle. This dough will yield about 12 buns. If you're a stickler with measurements, weigh the dough and divide by 12 and you'll come up with the weight for each bun. If not, eye it. I pull off about a lemon size amount of dough and roll it in my hand. I then place it on a Silpat (silicon lining) lined baking sheet and flatten it to look like the picture below. Once you have all of the buns ready, cover with a towel and put it back in the oven for the second rise. This rise will be about 45 minutes to an hour. Wholewheat bread doesn't have a big oven rise like white flour, but it does have a slight one. After about 45 minutes of the rise, remove the rising buns from the oven and preheat the oven to 375º. Bake the buns for approximately 20 minutes or until they are golden brown and sound hollow when you tap the bottom. Always let fresh bread rest for about an hour after baking as it continues to cook when it's out of the oven. Being on the road can be a bit stressful for plant strong eating. You don't know the area. There aren't always obvious choices. If you're staying in a hotel you're forced to eat out. I try to stay in hotel suites that have some sort of kitchen, be it only two burners or a regular stove. If I'm driving to the location I always bring my own knives, a cutting board and spices. I was recently in Las Vegas for 5 days for a convention, so when I arrived I hit up the local Trader Joe's and went to town. I got canned black beans, fresh peas, lentils, brown rice, tomatoes, green chilies, cilantro, potatoes and diced crimini mushrooms. The first night I made a big batch of brown rice. I brought my own onions, fresh garlic and as I said spices (I used the ones I told you about in this post. The room came equipped with pots so I was set. I sliced the onions and put them in a hot pan along with the mushrooms. I flash steamed/sauteed them until nicely browned. I added about a 1/2 teaspoon of cumin seeds, coriander seeds and fenugreek seeds. After about a minute add about 7 cloves of chopped fresh garlic and two diced green chilies (or to your spice level) and saute for another minute. I then added 4 cups of water and 1 1/2 cups of lentils. Bring to a boil and after 5 minutes I added 4 peeled and cubed potatoes. Now add 1 tablespoon of the spice mix from the same post I linked to above. Let this boil away until the lentils and potatoes are cooked. Add 1 teaspoon (or salt to taste). I added 1 cup of fresh peas right before serving. You can add freshly diced cilantro as a flavorful garnish. During the next nights I added drained and rinsed black beans one night. On another I added sliced firm tofu and on the last I made whole wheat burritos by adding fresh avocados and salsa. Easy, inexpensive and fulfilling. I did also make my own oatmeal every morning as well. Here's another place to go when looking for something quick and plant strong. If you don't have one near you, I'm sure you will soon. 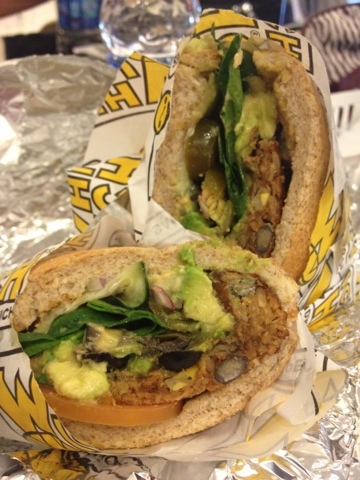 This is a whole wheat bun with a black bean patty, all the veggies and avocado. Add mustard and vinegar. As my brother can attest, I did not like Macaroni and Cheese as a kid. Hated it in fact. Especially the Kraft instant version. Bob and I sat next to each other at the dinner table growing up and we had a deal. When we were served vegetables, especially broccoli, he would scrape them onto my plate when no one was looking. When we had Mac and Cheese, I would scrape mine onto his. I always thought it was devoid of flavor. I could tolerate it if we added a can of tuna and a can of diced tomatoes, but never the unadulterated version straight out of the box. (But I didn't like pizza either, so I guess the inner gourmet was coming out way back then). I could tolerate homemade but we never made it the way homemade is done today. This is my first go round with this and I'm sure I'll be tweaking it here and there. This is delicious and creamy so that's all I'm going to say. Peel, cube and steam the butternut squash until it's soft. (you can cheat and buy the already cut and cubed version in your store. Cook the pasta according to the directions on the box (usually 8 - 10 minutes) I would do it a couple minutes less than the directions as it will continue cooking in the oven. In your food processor, add all of the ingredients up to the almond milk. Process continuously for at least 3 minutes and up to five. This is what makes everything smooth and creamy, so it's important. Slowly add in the almond milk, about a half cup at a time, until you get a light, creamy and a bit runny sauce. This will thicken when it's on the pasta, so don't worry about it being too thin. You'll probably have some cheez left over, so heat and serve it on the side. We've all had fish tacos. It's not usually about the fish, it's about what you put in the taco with it. These are easy and every bit as good as fish tacos without, well, the fish! You say potato, I say potaco. I have a gas stove in my home and I just put the flame on medium high, throw the corn tortilla right on the fire and flip it about every 5-8 seconds using tongs until it's sufficiently charred to your liking. For the filling I used already baked potatoes cut into cubes, cooked beans that I reheated, cubed avocado, Engine 2 Salsa (or any that is oil free), and topped with a little n(o)il and no dairy sour cream. If you haven't tried my sour cream, my sister tried it for the first time this week and is now obsessed with it, it's that good! You can serve them with fresh lime slices and chopped cilantro. A little hint about potatoes. If you remember my blog about mashing the potato myth, you can eat lots of potatoes and they're incredibly good for you. I buy a 10 pound bag of potatoes and when I bake them, I'll bake about half the bag and keep them in the refrigerator to snack on or for quick lunch or dinner like these tacos. At $4.99 for 10 pounds there's a lot of bang for your buck!!! Thank God for Trader Joe's. After a couple of long days at work I didn't want to cook and didn't want to go out, so I went to Trader Joe's. I still had some left over slow cooked black beans so I knew I would use them. I headed to Trader Joe's for some inspiration. I found a bag called Kaleidoscope Chard. The package said "Cut, Washed and Ready to Cook" so you have to love that. Next I saw one of my favorite things, bags of cubed butternut squash. Could this be any easier. Throw in a mini (about 5 inches around) of whole wheat n(o)il bread and dinner is calling. I put everything in a pot with a bit of water for steaming, covered it and heated it on medium low until the butternut squash was tender. Put it all in a bowl with a little Sriracha Sauce and dinner was served. Easy was the key word here. Growing up in a large family we went through a lot of food. Sometimes we improvised on meals and created instant classics. Slop was such a meal. I've taken the old 1970's recipe my mom and I came up with and brought it into the 100% whole food, n(o)il, plant based era. Boil the RVS and rehydrate the TVP and mushrooms for about 10 minutes. In a hot skillet, saute the onions and red peppers. Remember to keep everything moving in the pan and if they begin to stick, add a touch or water or RVS. When the veggies are brown, add the garlic. Keep it moving for about a minute, then add the TVP and mushroom mixture along with the liquid it was soaking in. Mix well then add the remaining ingredients. Continue simmering until most of the liquid has cooked down. Taste for salt. The Better than Bouillon has salt so you may not need more...depends on your taste. Serve with a dollop of my sour cream n(o)il of course, some of my whole wheat sourdough bread and a nice Zinfandel and you'll have a great meal. You can also add frozen edamame beans, fresh spinach or cut up lacacinto kale for more veggies. A lot has been said and debated this week regarding the study that says a Mediterranean diet is the way to go. I will say that it is better than the American or Western diet, but it's far from perfect...and adding at lest 3 unnecessary tablespoons of fat a day is about as ridiculous as it sounds. You can find studies that will represent your side of the argument all over the internet. I encourage everyone to do some research and make up your own minds. Remember that you should always look at who is sponsoring and who benefits from the study. I've approached this style of eating for health reasons period. All of the research I've done as well as my own health, have given me everything I need to stick with the program. One month away from a year on the plan and I've never felt better. More energy, 35 lbs less weight, low cholesterol, low blood pressure, clearer mind....I'm sold. You have to have the conviction to adopt this way of eating regardless of what your friends and family tell you. There are naysayers everywhere, but in reality it's your life to live. Don't force your plant based diet on others, merely lead by example. Listen to the noise, and continue what you're doing. I've done a little research for you so I'll add a couple more links about the Mediterranean diet here.